NAB Show 2019 is coming soon. 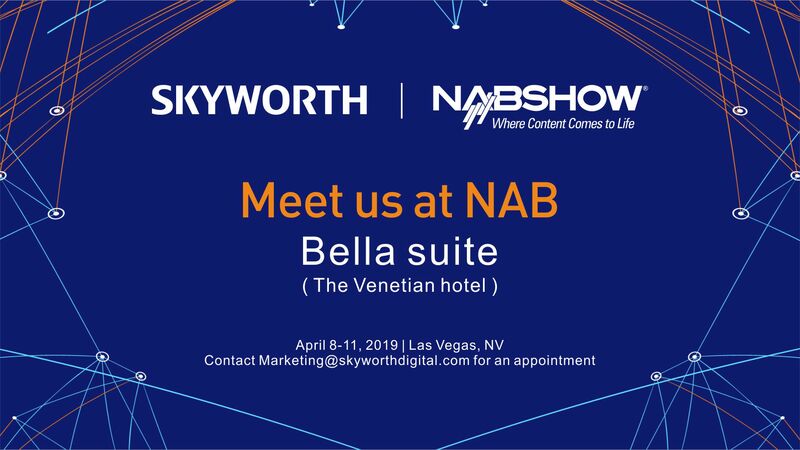 As a positive player in DTV industry, SKYWORTH will be visiting NAB Show 2019 in Las Vegas. Skyworth Digital is looking forward to see you in Bella Suite at the Venetian Hotel. Reach out to us today to discuss your schedule here: marketing@skyworthdigital.com. Organized by the National Association of Broadcasters, NAB Show showcases the media and entertainment industry's most dynamic innovations and cutting-edge technologies, breaking the boundaries of conventional thinking to open your mind to new possibilities.